The sound Islamic Creed is based on the Qur’aan and the Sunnah as opposed to the other creeds. The sources of the other creeds differ and you’ll [also] find them being in opposition to each other- filled with contradictions and diverse orientations. As for the person who has been blessed with the sound Islamic creed, he is saved from all of this. The Prophet [sallal-laahu-alayhi-wasallam] said that Allaah said: ”Indeed, I created my servants as Hunafaa [i.e. inclined towards monotheism and distanced from polytheism], but the devils divert them from their true religion [of Islamic monotheism]”. This shows that those who nurture the people upon the sound Islamic creed are the callers to that which is in agreement with the natural disposition and sound intellect, as opposed to the false creeds because they are in opposition to the natural disposition and sound intellect. Those who call to false creeds utilise lies, deceit, fables, dreams etc…. to spread those false and deviated creeds. ”Those (angels) who bear the Throne (of Allah) and those around it glorify the praises of their Lord, and believe in Him (i.e. believe in the oneness of Allaah), and ask forgiveness for those who believe (in the Oneness of Allah) (saying): “Our Lord! You comprehend all things in mercy and knowledge, so forgive those who repent and follow Your Way, and save them from the torment of the blazing Fire!’’ [Soorah Ghaafir: Ayah: 7]. So they (i.e. 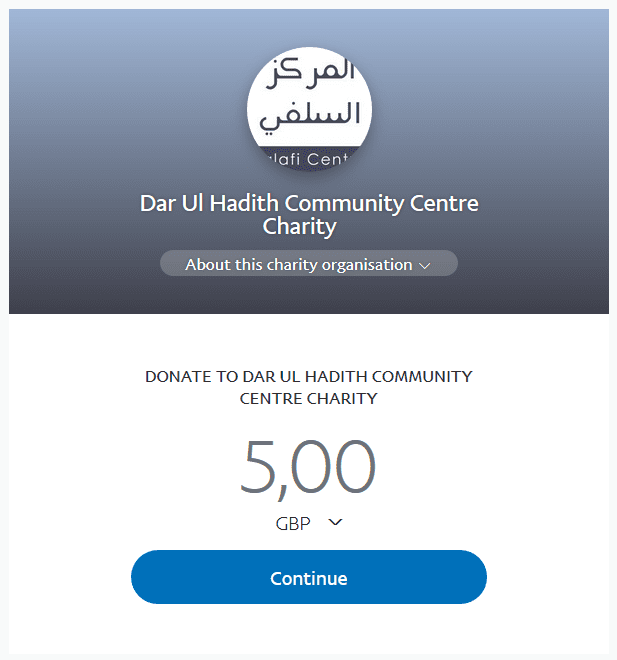 the angels) supplicate and ask Allaah to forgive the believers, and this bond between them and the believers is due to the sound Islamic creed they share. ”Friends on that Day will be foes one to another except Al-Muttaqun ([the pious and righteous persons who fear Allah much (abstain from all kinds of sins and evil deeds which He has forbidden) and love Allah much (perform all kinds of good deeds which He has ordained)].pious – see V.2:2). Shaikhul Islaam Ibn Taymiyyah (rahimahullaah) said: The hearts were created to be upon Tawheed, but when they abandon what they were created for, they become confused and bewildered. The heart’s need of Tawheed and remembrance of Allaah is like a fish’s need for water. 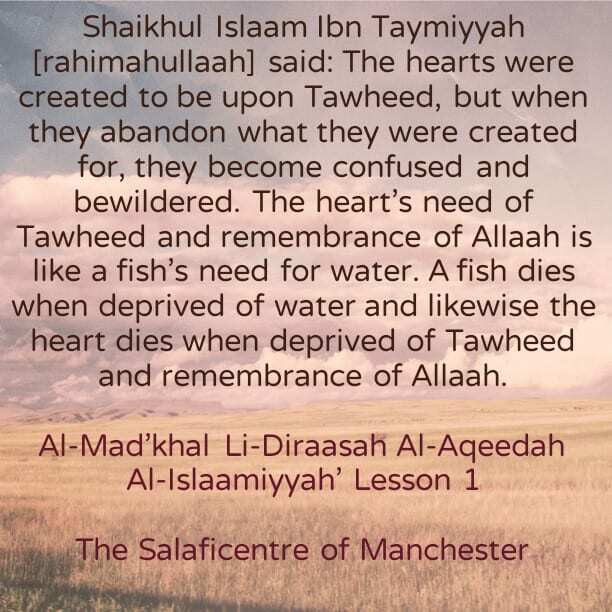 A fish dies when deprived of water and likewise the heart dies when deprived of Tawheed and remembrance of Allaah. The sound Islamic creed is a creed of uprightness and justice- neither going beyond bounds nor falling short, as opposed to the other creeds. There is not an affair in the religion- be it the beliefs, acts of worship and its laws—except that the people are divided into three categories in that regard; [a]The Extremists [b]Those who fall short and [c]Those who remain upon uprightness and justice upon the sound creed-those who cling to the Qur’aan and the Sunnah.